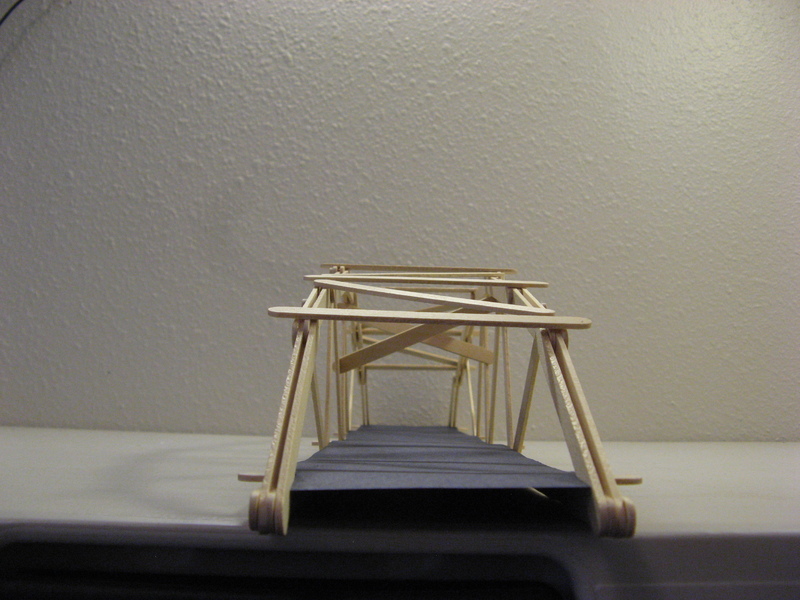 This improved version of Popsicle Bridge #2 used 78 popsicle sticks, weighed 95 grams with the roadbed. It held 73 pounds before failure which makes its efficiency score 352. 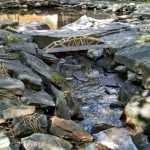 Why did we design and build this bridge the way we did? 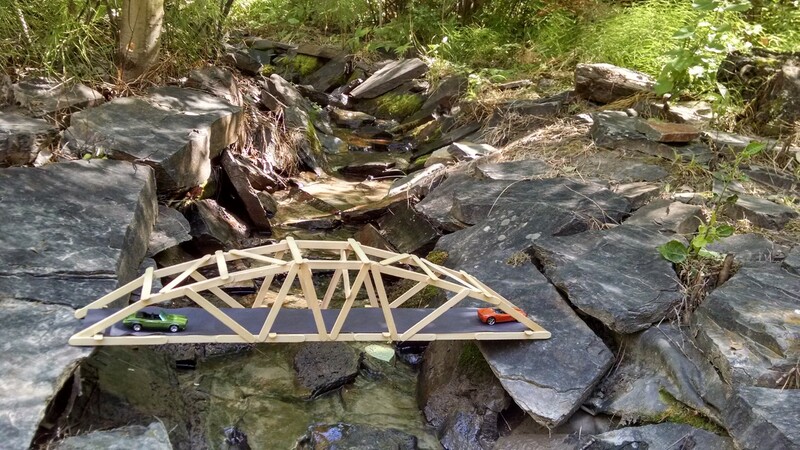 This bridge does not require cutting or in any way modifying the popsicle sticks. This makes building much easier. 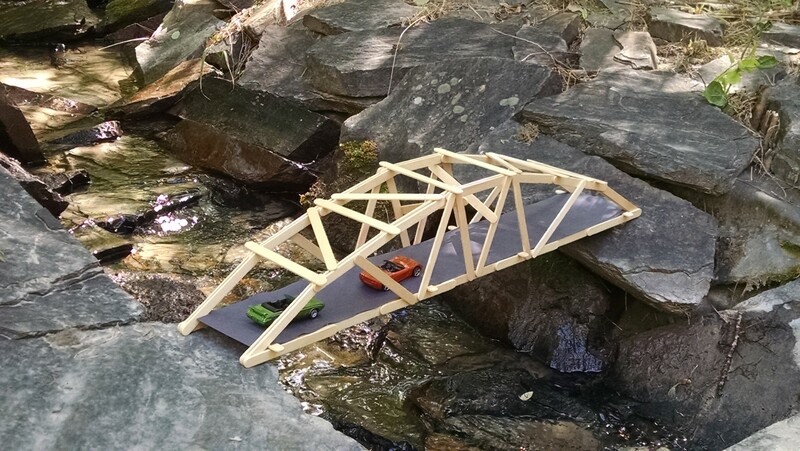 This bridge is actually 25″ long, so it spans a 24″ gap with 1/2″ on either side to spare. Rather that going for pure strength, we at Garrett’s Bridges have always focused on the efficiency score. This allows us to keep the number of popsicle sticks used down to a minimum. 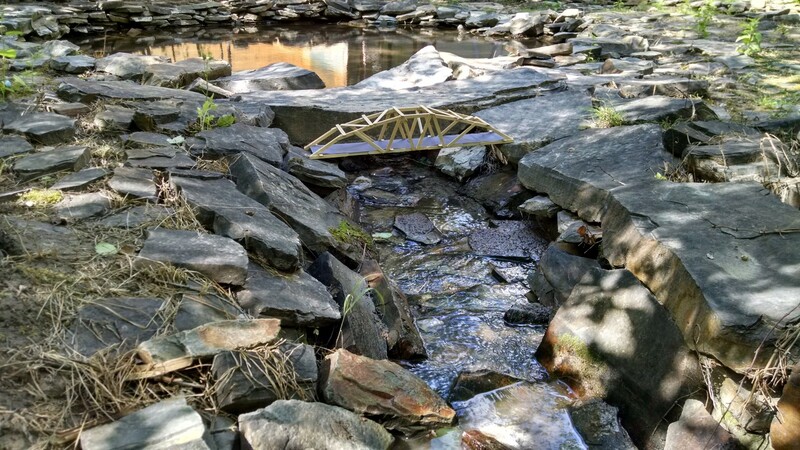 This re-design of an older bridge is significant because as Garrett’s Bridges, we are moving towards incorporating more realistic design principles into our models. This means we included a roadbed. We also moved and reduced the lateral bracing to allow “traffic” to move through the bridge. 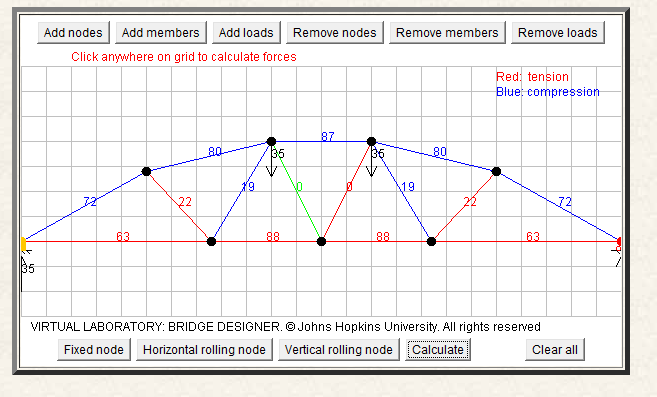 These two design elements really increase the usability and overall functionality of the bridge model. 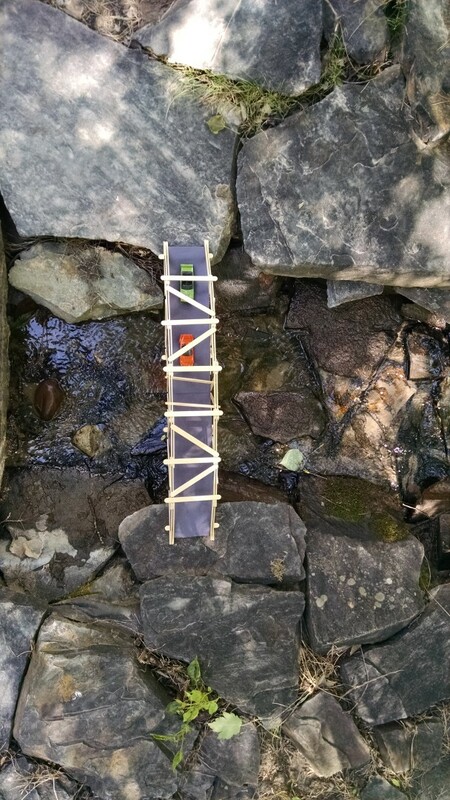 The initial test, during which this bridge held 53.2 pounds of sand without breaking, showed an interesting side effect of our chosen loading method. We used the bucket on top method, and simply poured sand into that bucket. It appears that despite our efforts, the bucket was not completely centered on the bridge, which caused the bridge to lean. This would have eventually caused a early failure, but we ended up filling the bucket completely before this happened. Interesting, the lean of the bridge was towards the “right”, while the bucket had more weight on the “left” side of the bridge. You can clearly see this in the video below. This version of the bridge was just as efficient as its predecessor, at least the “weaker version”. This is good news, and we will have to wait and see as we try a different loading method until failure. Also, we learned something about the bucket on top loading method, and how critical it is to get the bucket centered laterally. We don’t think it is quite as important to center the bucket lengthwise on the bridge, but you can see the tell-tell signs of the bridge starting to go in the video. This could have been reduced if the weight was actually centered over the bridge. For the second testing we chose the Human, Stand on Top method. It was immediately apparent that this method would most likely cause the bridge to shake and become laterally unstable very quickly. It was very hard to stand evenly on the bridge. 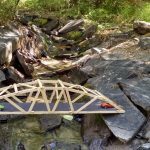 This time the bridge held 73 pounds before failure. This was definitely an improvement, but it was also a definite pre-mature failure. This puts the efficiency score at 352, which is right in the middle of the two previous versions. 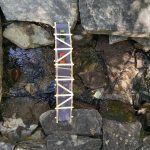 Undoubtedly if we had used a more stable testing method this bridge would have held significantly more. 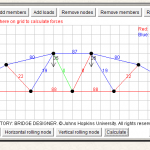 But there are also some ways we could add more bracing. 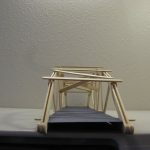 It is clear that this version of the 25″ Arched Warren Popsicle Stick Bridge is an improvement over its first predecessor. 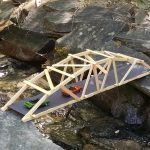 Unfortunately the design elements that made this bridge more realistic also reduced its strength from the “stronger version” of its predecessor. 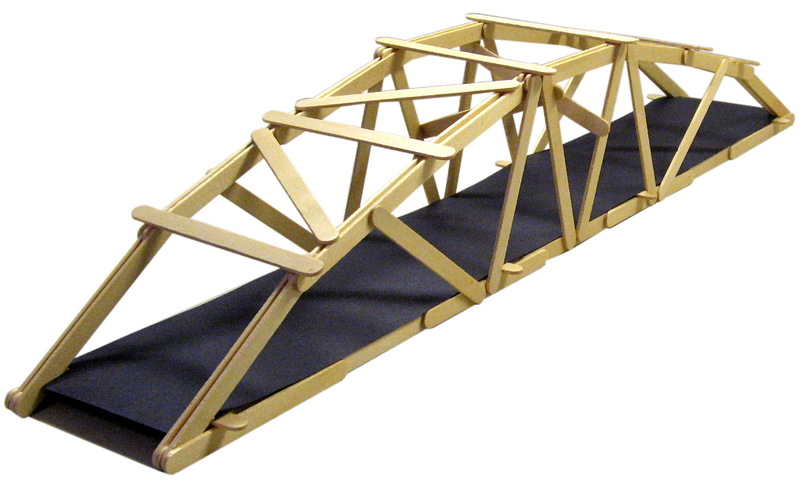 The reduced lateral bracing made a huge impact on the strength of the bridge when using the human testing method. If you recall, the predecessor was stood on multiple times before failure. Each time a heavier person stood on it. The lateral bracing makes a huge difference in the stability, and in this case that directly related to its overall strength. 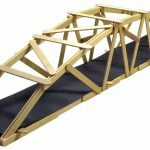 We have both blueprints and a full kit available to make it super simple for you to build this bridge on your own. Included with each of these are ideas for you to modify the original design to make it even better. 53 queries in 0.437 seconds.